It's Muffin Tin Monday with a number theme this week. F&B and I went through some of our books involving counting (OK, pretty difficult when the "baby" is now 5) and finally chose Ben's suggestion of Five Little Monkeys Jumping on the Bed! for a total of 5 little monkeys! And freeze dried bananas because monkeys like bananas. These are from Crispy Green, from a review I wrote on MomTrends, F&B love them! I love muffin tin mondays. I send my 10 year old son bentos to school on the days he wants to take lunch but its always a challenge for me to think of stuff to feed my 3 yr old daughter and i really think she would love this. love love love it! great minds think alike indeed. :) I had so much trouble with the size! my original size kept falling down! I love your monkeys. They are amazing. That is sooooo cute! Evan would love it as "5 Little Monkeys Jumping on the Bed" is his favorite song/book. Plus he's 5! 5-years old/5 monkeys! I wouldn't dare do this, as MY little monkey LOVES jumping on the bed and, despite falling off and bonking her head one time, doesn't seem to understand the moral of the story! 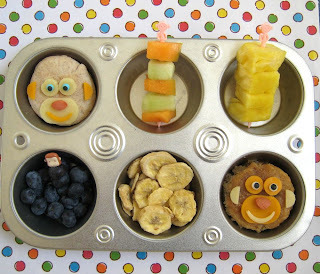 Am sure you and the kids had fun 'monkey-ing" around this muffin tin monday! Nice! So cute you and Michelle had the same idea. Love the tin and the monkeys are so sweet. Great job as always hun!! So cool! Your monkeys are awesome! Wow- so creative and monkey-fabulous! Creative use of monkeys!!! I love the faces you created!!!! Wow, these are so cool! You're way more creative than I am! Love it! Cool, more monkey themed tins. I love it. My daughter loves that story, her grandma got her the book a while ago. I will have to keep these in mind for a future muffin tin. Never heard of bentos before. Very cute! I love all the monkeys! Laural and Micah would flip over this one! I think I'm going to have to borrow some of the MTM monkey ideas I've been seeing today!